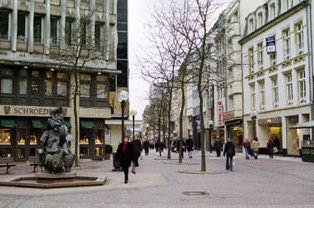 Given that tourism is such a flourishing business in Luxembourg, there is a fine variety of stores in the capital city and other sites nearby. Clothing stores provide anything from Parisian haute couture to other, more modest European chain brands. Those not willing to pay high city prices have the option of taking a day-trip to cities in bordering countries to shop at popular mall outlets. There are many bookstores that sell texts in French, German and English. One can find at least one English bookstore, and one that offers Italian and Spanish. Newsstands are everywhere. The three malls are very small and are centered around large supermarkets. As in the United State, malls are used to find varied items such as computer products, clothing, shoes, and household goods. Shoes are particularly expensive in Luxembourg as are most American name brand products. Although there are not the large, popular chain clothing stores found in the United States, it is possible to find name brand clothing in independently owned stores and boutiques. Stores generally open from 9:00 a.m. to 8:00 p.m. Tuesday through Saturday. With the exception of large supermarkets, most stores close on Sunday and do not re-open until noon on Monday. Most stores close early on the eve of a holiday. Convenience stores stay open on Sundays and close on other days of the week. "Shopping at the Gas Station"